One of our members, Kyle Lisek, sent me a request this week asking if our club could get at least one Tesla to display at the UCCS campus on Wednesday, April 13. I said we could, but we need to see who and when our members can assist. I've asked Kyle for information about having cars there in shifts so no one person has to tie up their day sitting next to a car. I can be on-site from 2:00pm until 4:30pm, but we need at least one Tesla earlier than that. Here's Kyle's original email. Please see the bottom of this post for the flyer attached. Please see the attached email from the University of Colorado - Colorado Springs Campus Sustainability Team. 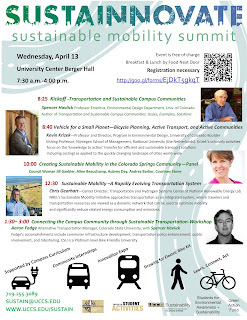 On April 13th, UCCS is having a sustainable transportation event and have asked me to work on getting environmentally friendly transportation technology companies to come display/talk about their vehicles or technologies. While we are working to get some larger companies, to me, it sounded like UCCS’s biggest concern was having a Tesla on display at the event. I thought I would reach out to you and the CSEVC to see if this was something you guys might be interested in attending and displaying one of your Tesla’s at? You would have a table/ booth for the CSEVC and free entry and food during the event on April 13th. Student, faculty, staff and attendees will just want to look at the vehicles (no driving) and talk with the owners about them. I can of course get you any information you need, but I wanted to see if this might be something of interest to the group before I look at filling up the rest of these vehicle spots that are needed. I can think of nothing more romantic than giving a significant other an electric vehicle, can you? Make this Valentine's Day special by buying an EV and telling the special person in your life about it. Make this an EV Valentine's Day! We have a new member, Peter Mattaroo, who owns a Model S70D. Please welcome him the next time you see him! In the attached article, some researchers at the Swiss Federal Institute of Technology are proposing on-site energy storage for charging EVs. They see two advantages: 1) reduced demands on the grid for rapid charging, and 2) potentially faster charging as the EV could draw more energy faster from a storage device than the grid can deliver. Your state beating you down about an EV? Come to California! In an interesting move to promote EV use (as well as California companies), California just passed a law eliminating state tax for EVs purchased in the state and registered in another state within 30 days. Take that, Texas and New Mexico! The following article is an interesting rebuttal to criticism that new incentives for EVs are special interest by having the taxpayers subsidize EV owners. From what I can gather from the article, it states that using more electricity off-peak balances the system and somehow reduces everyone's prices. Pop quiz after reading the article: what does it say utility companies are doing with rooftop solar?